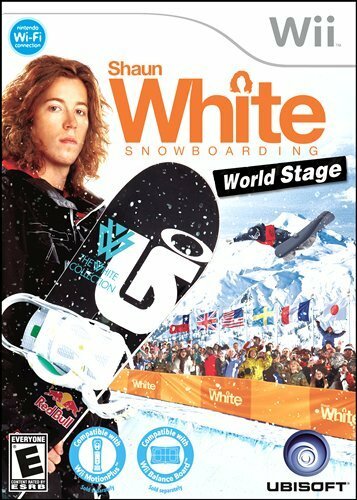 Shaun White Snowboarding: World Stage (2010) includes approximately 75 challenges among eight mountains. This game features easy controls and expansive multiplayer modes plus new features which let players create/name their own tricks and upload high scores/times online. The use of global venues including New York’s Times Square, France, San Francisco, Canada, and Japan expand this snowboarding sequel, which continues its unique visual style. The storyline features Shaun White with familiar, uniquely skilled characters and a few new ones along for the ride as well. The total character set expands by four to 12 with New Zealander Doug, the Swedish Mats, Italian Mario, and Spanish Luna joining the ranks. All characters have special abilities and different strengths (all included in the manual). Jasmine and Gordon still have better jump and speed ratings respectively than Shaun. Developers also still incorporate the respect power option where players fill a meter (picking up crowns, passing through gates, etc.) to use their accompanying friend’s special ability. In the campaign mode, set in an airport, players work their way up a worldwide leader board from 100th place in stage venues ranging from beginner to pro. The three multiplayer modes include a great cooperative mode where two boarders can add their score together. It provides an excellent way for advanced players to help novices. The competitive mode includes free play while the turn-based hot seat mode features hologram chase play where players beat the best. As many as four players can ride the slopes at a single time, with control schemes including new compatibilities with the balance board and now the Wii MotionPlus. The multiplayer modes only allow use of one balance board. The Balance Board represents an authentic control experience where body control, correct position, and weight shifts prove crucial in commanding one’s board. The remote (used for steering and button combinations) and the Wii balance board/MotionPlus control combination still give players an authentic, full-motion experience. The Wii MotionPlus exclusive arcade machine mode lets players customize their own tricks to use in the game. The move capture has good accuracy; just be sure to keep the landing straight at the end. Advanced moves mostly involved Wii remote movements combined with specific button combinations in the air and on the rails. The visuals include the signature “covered in snow” collisions, which add some nice role-playing elements and some realism. The environments are covered with sponsors while reward items include jackets, stickers, boots, helmets, and, of course, boards. The simple controls expand the age and player skill range who can enjoy this winter sport game. Additions to the franchise down the line could — and possibly should — include a selectable music jukebox with real songs and Mii player incorporation, but further expansion of the worldwide locations and online competition with other real players seem more likely. This entry was posted in Film Reviews, Video Game Reviews and tagged Games, Michael Siebenaler, Mike Siebenaler, Shaun White, Tall Writer, video games, Wii. Bookmark the permalink.